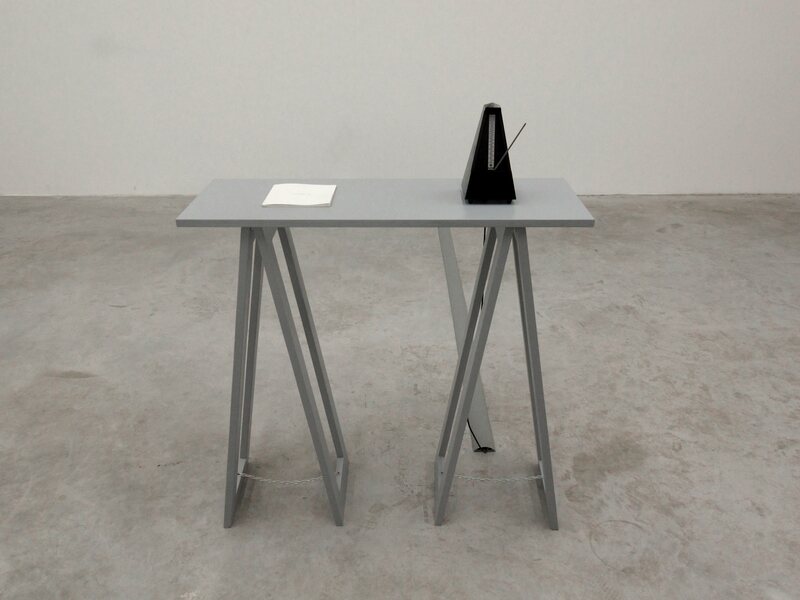 Book by stanley brouwn my steps 12.12.2005  1.1.2006, modified metronome, table. By way of reading the artistic book my steps 12.12.2005 - 1.1.2006, the project establishes a relationship with the opus of the conceptual artist stanley brouwn (Suriname/Netherlands), whose many works address the (im)measurability and materiality of the distances and their archivisation through the process of counting his own steps. The project contains three elements  the book my steps 12.12.2005  1.1.2006 of the artist stanley brouwn, an action of Tao G. Vrhovec Sambolec, and an installation which repositions the book and the action “in the now” as an unclear and elusive rhythmical instruction, suggestion, norm or support for movement, reflection or listening. Reading stanley brouwn is a part of artistic research project Rhythms of Presence.